Sergey Lavrov and John Kerry met in the Southern Russian city to discuss international and bilateral relations. While giving no comments about the subject of the talks, the Russian Foreign Ministry wrote on Facebook about the gifts the two diplomats exchanged. Lavrov gave his overseas counterpart a t-shirt featuring the symbols of the Soviet victory over Nazi Germany, whose 70th anniversary Russia has just marked. He also presented John Kerry with two baskets of vegetables: tomatoes and potatoes, which, according to Foreign Ministry spokesperson Maria Zakharova, are"distantly related to the ones given to [Lavrov] by his American colleague a while ago." 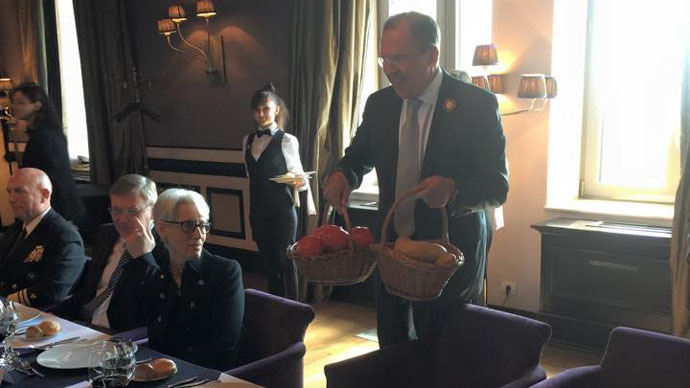 In January 2014, Kerry gave Lavrov two large potatoes from Idaho, while the two were holding talks in Paris. Lavrov later said a Southern Russian farm asked him to donate the potatoes for cultivation experiments. However, later a ForeignMinistry source was cited by the media saying the potatoes didn't take. As a return gift for Sergey Lavrov at the Tuesday meeting in Sochi, John Kerry gave him a collection of quotes from the Russian media, which, as he said, "do not reflect the true potential of Russian-US relations," according to the Foreign Ministry's facebook page. That was later denied by the press secretary of the US embassy in Moscow, who wrote in his Twitter that Kerry in fact gave Lavrov a briefcase as a gift. After the meeting, both Lavrov and Kerry proceeded to hold talks with President Vladimir Putin.